. Oh. Okay. That shouldn't be a problem. My dad's an accountant, and I associate these machines with him. You've seen them, even if you've never had cause to use one. They're like over-sized calculators with a spool of receipt tape atop, that prints out what yer' computin'. They make a very distinctive noise that usually indicates someone who is deep in concentration. 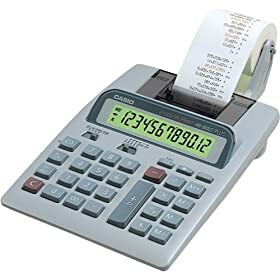 When you enter a figure into yer' computin', it prints it with a brief gear-y, scratchy sound, and when you want to pound out the final total, it makes these sounds for considerably longer (having as it generally does more to print at the end) as though to say, "Congratulations! You're one major step closer to whatever you're doing!" Interestingly enough, these machines also have the addition and equation symbols on the same, over-sized button. if he makes one over-sized? WHAT the HELL?! After many minutes of flicking mysterious switches experimentally, trying to interpret all these "M-" buttons and generally doing what I do to figure something out with Microsoft programs, I notice something. In the column of function keys, there is one labeled "x" and one labeled "*". Huh. In my (computerized) mind, those are both symbols for multiplication, so I didn't find either out-of-the-ordinary when regarded individually. When I noticed both were there, I tried pressing "*". figures were added together to make the total! I could make-out with my adding machine! It would not be a lasting relationship, however, infused as it is with such opposing passions, so I relented in my desire. (Zarko) often laments -- that we don't all know the same dances anymore. Dances. Adding machines. What does it all mean? Nothing in particular to the nouns, or even all the words of my little meandering story. It's in between those words. to know more dances -- if I had a community that regularly met in order to share them. is excellent about striking up educational conversations with everyone he meets, a trait I most admire and try to cultivate in myself. In many ways, this is part of what's so important about live theatre. I don't know who's teacher and who's student in that scenario, but I do know we're all there with a little time to get to know each other, and learn to push each others' buttons.